When I began my bobsledding career, I never imagined that I would slide for three different nations. However, I did believe that I would be the best in the world. I lived in Jamaica, had never travelled and had never seen snow, but I knew that I was going to be the best. While preparing for the 2002 Olympic Games, two events happened which would help set me on that course. The first, I met my future wife, who happened to be Canadian. The second, I was told the Jamaican bobsleigh team had no chance at being the best. For a minute I believed it. However, I decided there was no way I trained so hard for so long to have someone shatter my dream with words. My job was to push fast and that’s what I planned to do. We had won every push competition we competed in, even though none were on ice. The non-believers were wrong and I was going to prove it. At the Games in Salt Lake City, we started pushing and the Canadian commentator laughed at my push effort and said I was making a rookie mistake. Before he got to say much else, Winston Watt and I had recorded the fastest start; not just at the Olympics, but the best-ever on that track. That record would remain for over nine years before it was broken by 1-100th of a second. In November of 2002, I married my wife and moved to Canada. At the time I really had no intention of competing for Canada, but I was training with the Canadian development team. Another year went by and I received my Canadian Permanent Residency and my Jamaican team had not yet come to Calgary. It was at this time I was approached by someone from Bobsleigh Canada and was asked to push for Canada. While it hadn’t occurred to me before, it was becoming more and more obvious that Jamaica would not be competing at the next Olympics, so I agreed to slide for Canada. After all, this is where I live, this is where my family is and Canada has been really good to me. During my first season with the Canadian team, Pierre Lueders and I won the two-man world championship. In my first couple of seasons on the team we earned medals in almost every race, and set several start records. This is where I belonged. This is where I was supposed to be. There was one major problem: I was not eligible to become a Canadian citizen until June of 2006 — four months after the Olympics in Turin, Italy. With tons of stress, many sleepless nights and a great deal of work by many people, I received my Canadian citizenship on Jan. 20th, 2006 — one day before the cutoff for Olympic eligibility. Since we were in Europe preparing for the Olympics, I could not afford the time or the jet lag to fly home and be sworn in, so my citizenship ceremony was held in Berlin, something I was told does not happen very often. Pierre and I went on to win an Olympic silver medal in the two-man event, and along with Morgan Alexander and Ken Kotyk, we missed out on a bronze in the four-man by a few hundredths of a second. 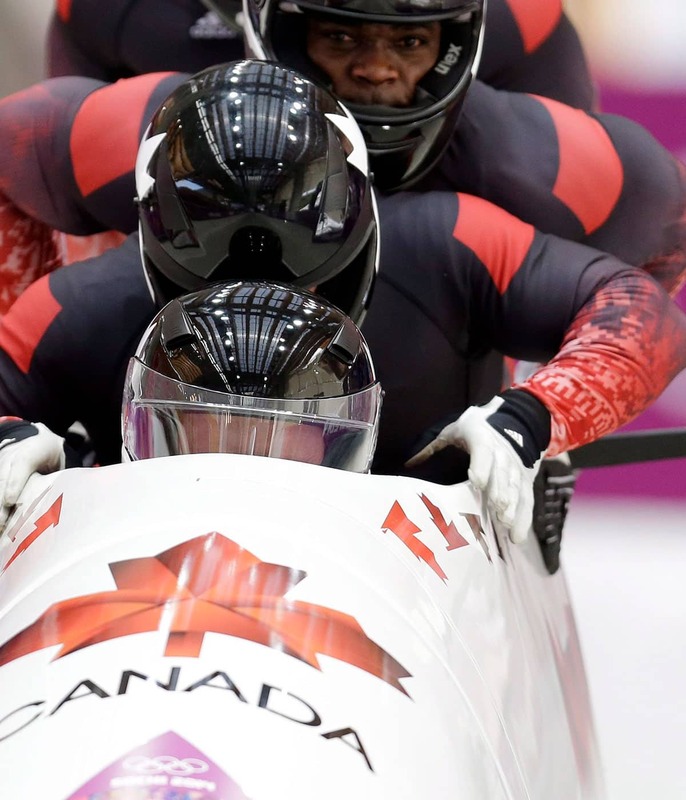 Even though I helped win the medal for Canada, the headlines around the world were, “Jamaican bobsledder wins Olympic medal.” I made news in Sports Illustrated and the New York Times; it was pretty surreal. I was the first Jamaican-born athlete to ever win a medal at the Olympic Winter Games. My successes continued at the 2010 Olympics in Vancouver on home soil, when we won a bronze medal in the four-man with Lyndon Rush, David Bissett and Chris LeBihan. Things weren’t as good in the two-man event as we crashed on our second run. After travelling and competing with the same people and the same teams for years, you build bonds and friendships, and teams help each other out. Monaco had helped us out quite a bit in the past with equipment that we would otherwise never have had access to. Monaco’s driver was a good pilot, but did not have a push. He knew that if he had someone great behind him that he would have a chance at winning a medal. So when he asked me to join their team to try and give them the momentum they needed, it just seemed like the right thing to do considering everything they had done for us. I slid for Monaco for two seasons, and am the proud owner of their only World Cup medal in any sport - a silver achieved in Calgary in the two-man event with Patrice Serville. The intention was never for me to compete for Monaco at the Olympics, but rather to help them get back on their feet, which I think I did. In 2014 I returned to the Canadian team for the Sochi Games with disappointing results. We could have and should have done better. I’m competing again for Canada in Pyeongchang at my fifth and final Olympics. I may have represented three different nations, but I was always meant to slide for Canada. It was always the plan, even before I knew it. I have been asked by many different countries in my career to slide for them, but I belong with Canada. My life is here, my wife and all six of my children are here, and my mother and one of my brothers are here now as well. Canada is home. My plan is to finish my collection and win gold at these Games. I would like to do it for myself and I would like to do it for my family, but I would especially like to do it for Canada. At 43 years old, I’ve been told I’m “old as dirt” for a bobsledder. At these Games I’ll be competing against athletes the same age or younger than some of my children. But I’m confident in myself and my abilities and I will show them all why I’m still here — to be the best.